My new Resources page is up but bear in mind that it is a work in progress. You can click on the tab on the header of my blog or on the red image (the same as the one at left) that is on the sidebar. 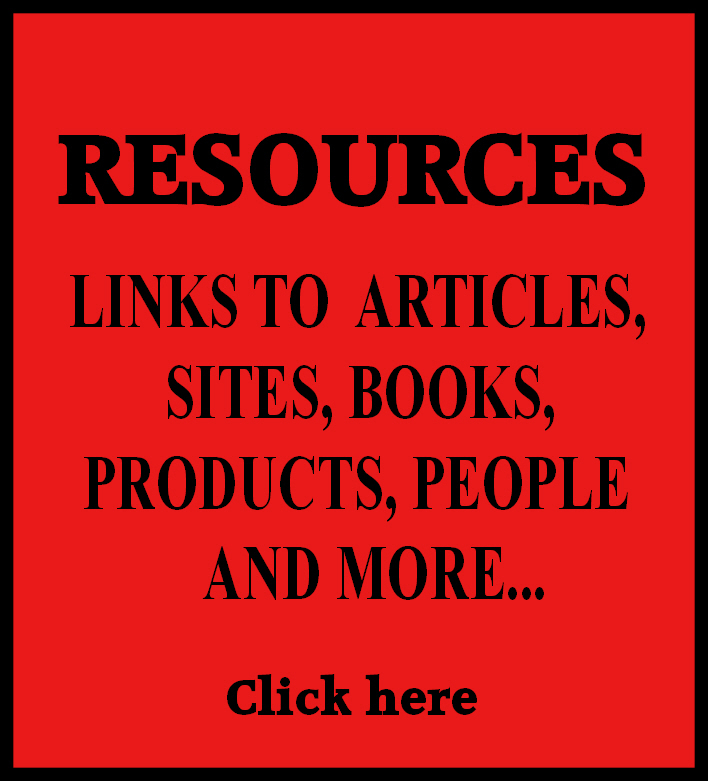 The idea is to dig out all the links to articles, sites and other resources that I have used in my posts over the last two years and gather them in one convenient place. I know how easy it is to forget that all that good stuff is out there. It’s even worse to remember that it is out there and not be able to find it! Ask me how I know. Slowly I am going through old posts and finding those links and re posting themhere. I often wonder if people go back and re read my old posts. I surprise myself sometimes when I do a Google search and run across something from my blog about which I have completely forgotten. So, you will find a handful of links that I have put there for now. 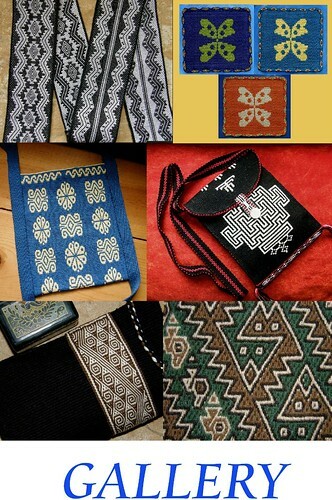 One of them is completely new – a free book on Mapuche weaving. 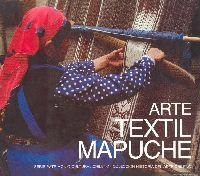 Many years ago, when I was still living in Chile, I bought a book in Spanish on Mapuche textiles from the Museo Chileno de Arte Precolombino. My friend Caroline, in Australia, told me about the free download of this book that is available some time ago, possibly before I even started my blog. Recently Luchita on Ravelry reminded me of it when she provided a link to the site where you can still download this book for free. If you go to the RESOURCES page you will find the link. The woman on the cover is weaving a large piece, possibly a blanket or a poncho, which has a plant motif. Copying it from the cover image, I was able to make this the second Mapuche design that I ever wove many many years ago. Here it is in my handspun llama fiber and it also happens to be the first time I ever wove with my handspun. I was so pleased with the result that I framed it even though it is rather wonky! I guess I didn’t think at that time I would ever weave with handspun again. It is a tiny piece as, if I remember correctly, many of the warp threads were breaking and it was a trial of patience. Fortunately my handspun improved as a result of this initial experiment and I have no problem weaving with it now. 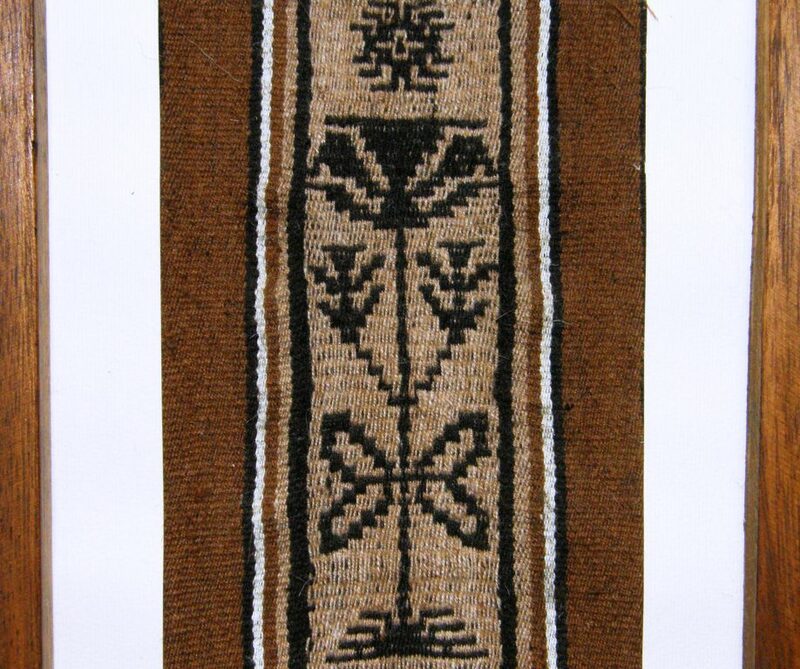 It is interesting to see variations of this plant motif on old Mapuche textiles and notice how it has changed over time. While skipping about on the net this week I ran into another almost forgotten resource…WeaveZine! Of course it is not entirely forgotten for me as my article is there but you tend to forget that WeaveZine has been around since early 2008 and there is a lot of great stuff on there. It was the article by Erica de Ruiter on this cute spiral zippered pouch made from a warp-faced band that took me there (go to the RESOURCES page if you want the link!). As editor Syne Mitchell puts it, WeaveZine is no longer in production, but as weaving is timeless, so is the content within this archive. I was clearing up a bit more today and decided to put away the Textile Museum Journal that has been lying about here for ages under a pile of cat toys. Of course this provided a nice excuse to sit down, browse and stop tidying up and I was curious to know what had made me buy this issue of the Journal in the first place. Oh yes, it was the article on the weavers of cotton saddlebags on the Santa Elena Peninsula in Ecuador. 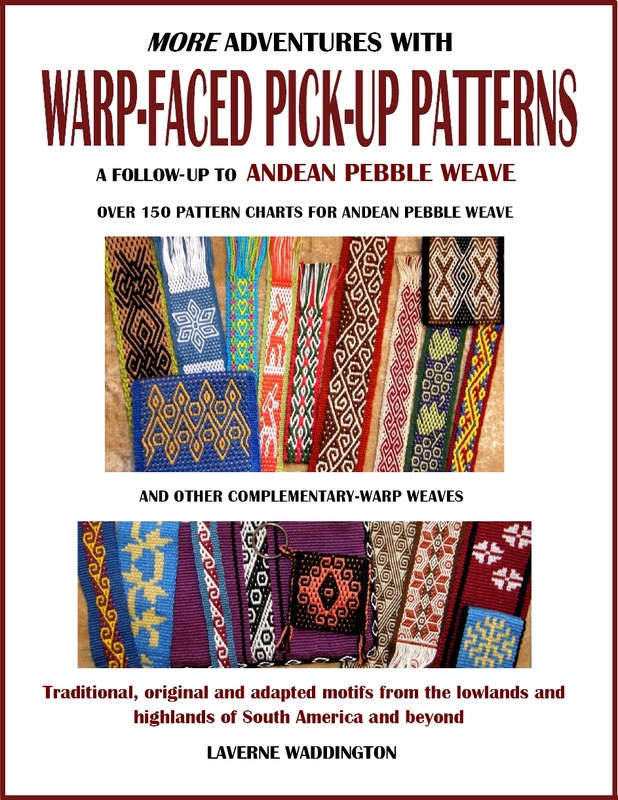 This article, among other things, gave me the little twin bird motif in the simple warp float technique that is shown on a cotton saddle bag from this region in the article. My version is at left. I usually buy these journals for one particular article, sometimes two, and just glance through the others and it is funny how months later suddenly one of the other neglected articles jumps out at me. This time it was the article in this 1983 issue by Maaike Knottenbelt on backstrap woven Mitla cloth of Mexico. According to the article the cloth was woven in skirt lengths for local use or for trade. Sadly, the article is in black and white and I was curious to see the traditional colors that are used in these skirt fabrics so I went online. A Google search didn’t turn up anything that looked like the cloth pictured in the article. And then….Teyacapan to the rescue! Of course I should have known to go directly to Karen Elwell’s fabulous Flickr page on Mexican crafts. 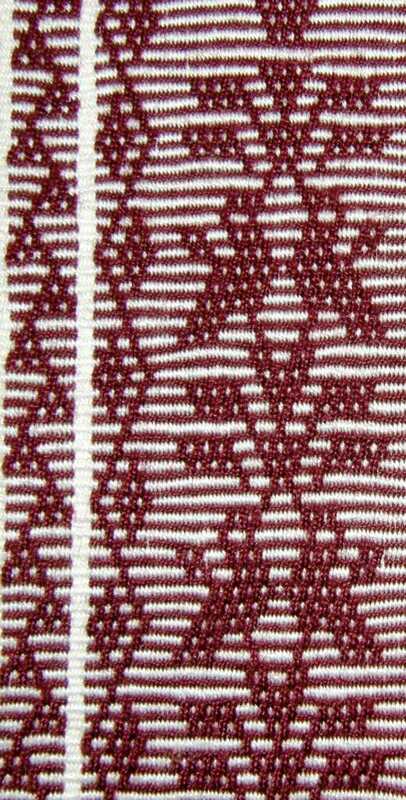 This is, as far as I can tell, a example of the Mitla cloth shown in the article. The cloth has two faces, one which is warp-faced which we would normally consider the “right” side and one which has exposed wefts. 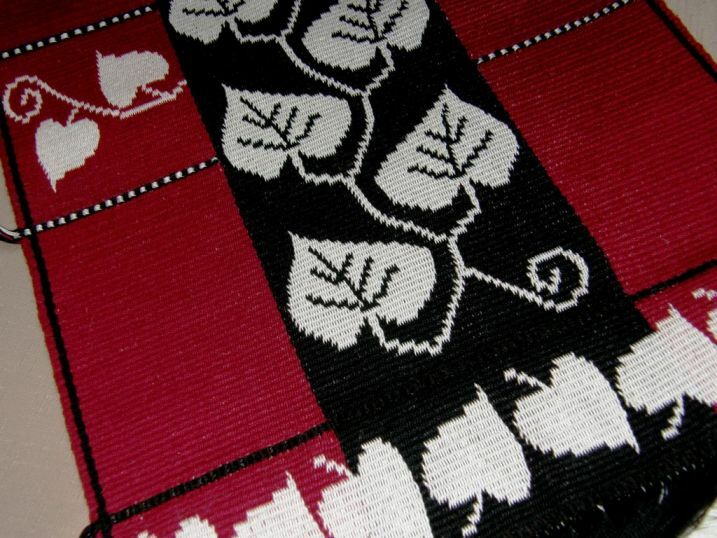 According to the article, the side with the weft floats is the one that develops as the upper face while the cloth is being woven and that is the face that can be seen in the picture. In 1957 only five weavers (men) knew how to weave this cloth, and only four Indians (men and women) knew how to warp the complete traditional pattern. 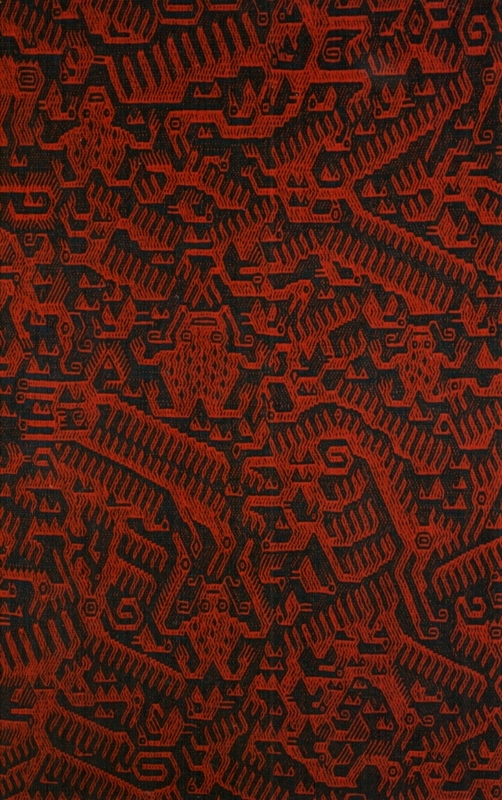 Knottenbelt published her article 26 years later and now almost 30 years after that I can’t find anything online about this kind of cloth being woven today and could only come up with Teyacapan’s photo of a museum piece. I wonder if it has completely disappeared. 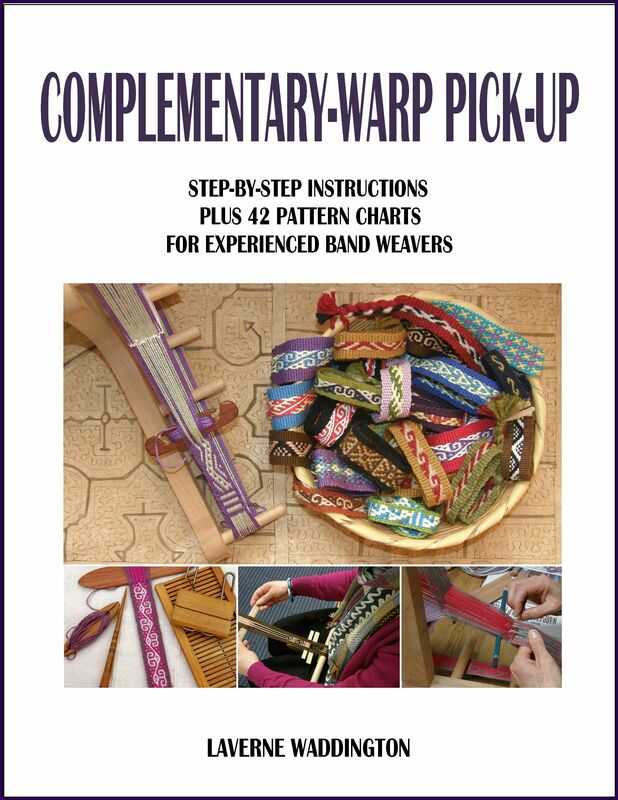 The article goes into a lot of detail of the warping process where the warp threads are separated into their various sheds on the warping stakes themselves. The warp threads are not wound in a simple figure-eight and then rearranged later once on the loom. This is one of the aspects that the author found particualrly interesting. 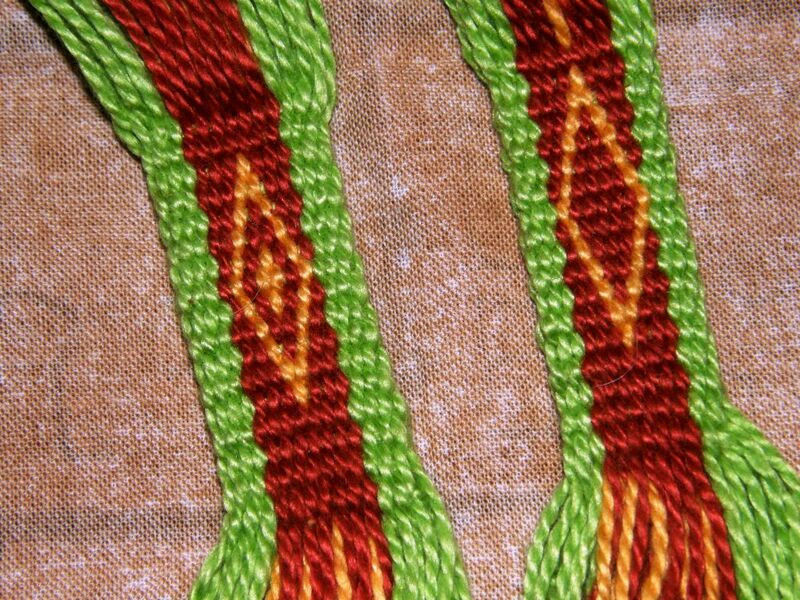 Eight stakes are used to set up this warp for a skirt length. Six can be used for shorter lengths. Of course, I have seen this kind of thing done here in South America. Extra stakes are added to the basic warping set-up to conveniently separate warps into different sheds according to the structure being woven. Felipe in Salasca, Ecuador is making a dovetailed warp for a supplementary warp belt using six stakes. The belt will be woven on his backstrap loom. Above is the set-up I created at home to practice what Felipe had taught me except that my set-up is for a warp in a single plane and so doesn’t have the dovetail stake. I actually added an extra stake to further separate one of the colors. Hopefully I will be able to use this to try the Mitla cloth. I just wish there were more pictures out there. Even the simpler four-stake version is a variation of this idea…separate the colors into sheds on the warping stakes themselves….such a time saver! I wonder what will leap out at me from the pages of that Journal if I pick it up again in a few months. There are three other articles in there and there is already a Turkmen tent band in there calling out for attention! In the meantime, I have just about finished my chamanto inspired wall hanging. The question is… how much pattern is too much pattern? I am not sure if I went overboard with the last row of leaves. I am now re-twining the bottom of the Starry Night hanging so that it better matches the twining on this piece. That didn’t seem like a fun thing to do at first as the piece was already off the loom but it turned out not to be a problem as I had not yet cut the end loops. I much prefer to twine on loom than off so that the warps are under tension. I was able to slip the far loom bar back through the loops and then clamp and roll the weaving so I could twine with the warps once again under tension. I have this nifty split loom bar that I bought from the Burmese backstrap weavers in Massachusetts. It is a typical round dowel-like bar which has been split in half and is used by the weavers to clamp and anchor their circular warps so that they don’t slip when beaten. The first thing that comes to mind is that surely it would be easier to just use two flat sticks but, they like the loom bar to be rounded, and I could see good reason for that once I put it into use. Lucky for me I got to buy one ready made. The third hanging in this series is on the drawing board. 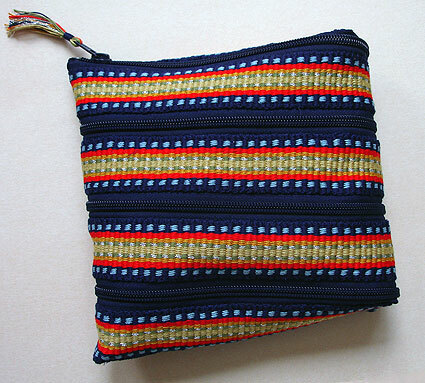 It will be influenced by South American weaving from a country a little further north this time. I hope to have made a start by next week’s blog post although there is a lot of sampling to be done first. Now, about that double weave edge experiment that I mentioned two weeks ago… I made my samples and photographed them. Unfortunately the pictures don’t really tell you anything so you will have to take my word for it! Both these bands have the same number of ends except that the one on the left has two revolutions of single thread on the very edges and the one on the right has only one revolution of single thread. Both methods improve the appearance of the edges for the reasons I gave in this blog post. The band on the left has a flatter square-ish edge while the one on the left has a more rounded transition from upper to lower layer. 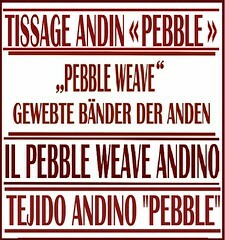 I will post all this information on the tutorial page for double weave. As for my earlier question… how much pattern is too much pattern?…I will leave you to ponder this with something truly spectacular…. 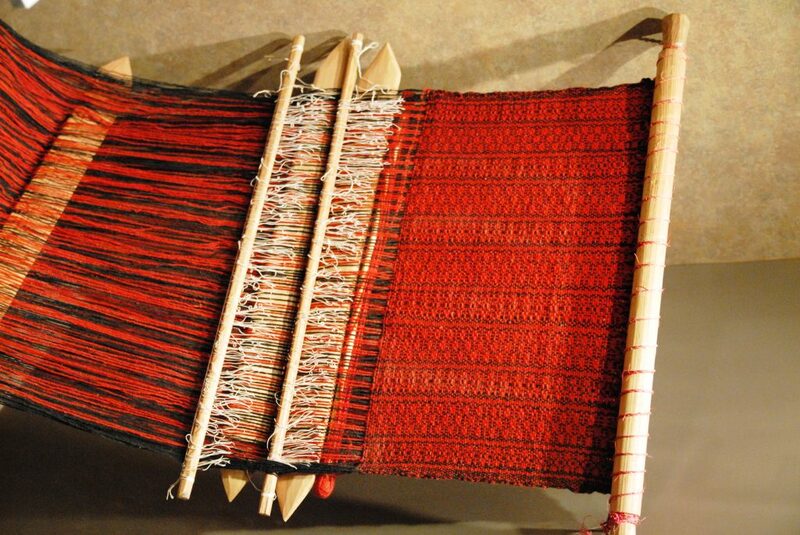 This kind of weaving is made by the Jalq’a people from Potolo in Bolivia on leaning vertical looms. There is barely any space that does not contain a motif. You even see motifs within motifs but, as the idea is to convey a sense of chaos, it all feels and looks just right, doesn’t it? Thank you for that resources page and for including my kits there. I know that you will keep filling it with the most interesting things. Your comment about finding past blog posts that you have forgotten about sounded very familiar. After a couple of years there is a lot of stuff there. You left me hanging, wondering what your next piece in the series is going to be……….. Can’t wait to see. Thanks Annie. Your blog has been going for two years or so too so I bet you know how it is! Are you kidding, Laverne? Your blog is an encyclopedia of information. I re-read your older posts all the time. I cant thank you enough for all the effort you’ve put into it. 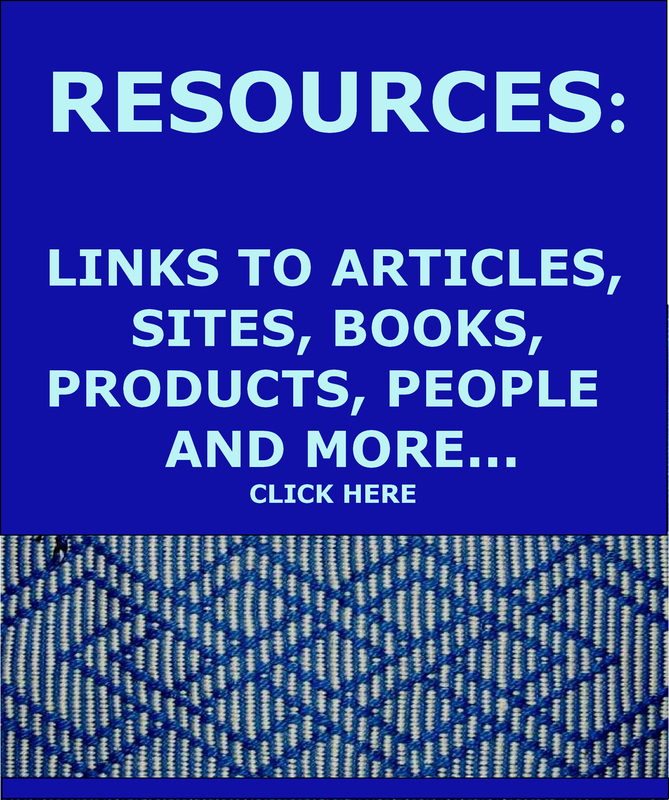 And I love the Resources page- it is very useful to have it all in one place. I wove with you recently. I’ve finished most of my bands, and wove up a new technique for me, then got side-tracked into tablet weaving using the backstrap. I’ve been having fun, but I’ll be on hiatus for a while with back surgery. 😦 But I’ll be reading and weaving vicariously via the blogging world. From your initials I am guessing you must be Lorah. Thanks for your comments and I am happy to know that you have time to look about in the old posts. Sorry to hear about your back. Thank goodness for the internet. You can be busy getting ideas and planning your next projects as you recover. Take care. Laverne, I have been reading through all of your archived posts, trying to catch up with all of the amazing and wonderful weaving you do and share! And as LB said, it is a wealth of valuable information. I’ve already returned to it several times. Your work simply amazes me! Leaning vertical looms? Are these like the oblique looms you’ve shown pictures of before? I could really get into those! Yes, they are the same thing, Franco. I was told recently by an authority on the subject that “leaning vertical loom” is a better name than “oblique loom”. Leaning vertical loom is more descriptive, for sure. I’m stunned to hear there is an authority on the subject!! I learn something new every time I read your blog.